All Things Dog Blog All Things Dog Blog: Dog Stories for Early Readers: Win One! Dog Stories for Early Readers: Win One! Helping young readers enjoy the process of practicing and learning to read has a lot to do with giving them books that motivate them. Dog stories are very popular with young children at this stage. This giveaway is designed for kids who are just beginning to read on their own, although still with help from you. Maybe your dog can join too? 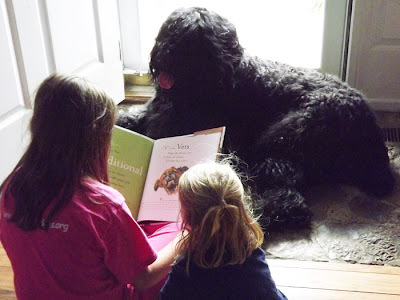 During our last giveaway, one enterprising reader sent us the photo below of her beautiful big boy, Vlad, enjoying a story read by her grandchildren. Isn't is just wonderful to imagine watching this scene unfold?!!! This giveaway will include 3 copies of each of the two titles you see in the photo at the top: Strike Three, Marley! and Ouch! It Hurts! Entries will be open through midnight Thursday, September 5. Winners will be announced Friday afternoon, September 6. That persnickety Rafflecopter may play dead under the spiral staircase again, but you can always tickle it by clicking on the post title at the top. It will jump up and help you join in the fun. Best of wishes to everyone who enters. Our little Popstar is an avid 'reader' at the tender age of not-quite-2. She'd LOVE either one! Oh, and she could 'read' it to me too! The title sounds engaging for young boys. They can also empathize with being hurt by a shot or something else. It creates a real life to text connection for them. Yes Because boys will be boys and they always have bumps and bruises! I know because I had 3 boys and I have a grandson. They are always getting hurt because the are very active! To help kids not to be so scared of the doctor. if i win this story book will go to a friend of mine with kids she just got them a puppy. It might be geared towards little girls to be nurturing? Just a guess. I'd guess that you picked "ouch It Hurts" because of the #Pet1stAid #twitter #party on Sept 10th. Thanks for the giveaway. "Ouch, it hurts" is maybe in honor of the first aid party? I'm guessing it will teach kids that their pets need their space and time to recover when they get injured. Once the pet is healed, the kids can play with them again! My nephew James has a lot of trouble reading. I want him to work on this so he needs lots of fun books and animals are one of his favorite subjects.